Many of the parents we work with find they need some extra support during their time with us. That’s where our individual counselling service comes in. Free one-to-one counselling for parents who are currently engaging with our services. All our counsellors are either fully qualified or third year students on placement. Mums and dads already involved with any of Friends of the Family’s services, who are not currently receiving therapy/counselling from a statutory agency. A referral is made to the counsellors by the Mums and young children or 5s to 13s Befriending managers. An assessment is made by the counsellor and, if both parties agree that they can work together, a verbal contract is agreed with the parent. Counselling for mums is run in term-time, with breaks during school holidays. Counselling for dads, through our support for dads service, runs through school holidays. The service is free. However, there is an expectation that clients commit to the process and engage with the counsellor to give the best chance of success. Numerous. The opportunity to have weekly sessions to address personal issues alongside support they are receiving through another of our services is invaluable to parents. Often our mums and dads need space to examine their own patterns and difficulties in a nurturing and non-judgmental environment. Further benefits include: addressing issues of anxiety, depression, loss, grief, low self-esteem, lack of assertiveness, insecurity, relationship breakdown, and parenting anxiety. "The counselling provided by Friends of the Family has been incredibly helpful. 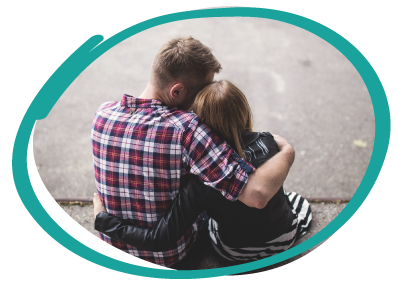 This service has made a real difference to the whole family, improving my relationship with my husband and giving me greater understanding of myself."